Several Naspers shareholders have recently expressed their dissatisfaction with the large discount that Naspers is trading at, relative to the value of its holding in Chinese online giant Tencent. Due to this discount, the market is not recognising the inherent value of Naspers’ core assets. At Denker, we believe it is only a matter of time before the true value of the core assets, which we are invested in, is unlocked. This bodes well for long-term client returns. In 2012, Naspers traded at a premium to the value of its holding in Tencent, a leading provider of online value-added services in China. The company’s subsidiaries provide media, entertainment, payment, smartphone and online mobile phone value-added services and systems, and operate online advertising services. This premium implied a positive value of R47 billion for Naspers’ core assets (these assets are shown in Figure 1). Currently, Naspers is trading at a 29% discount to its value in Tencent, following Tencent’s exceptional share price growth, which implies that the core assets are valued at a negative R515 billion, as shown in Figure 2. This diagram is a summary of Naspers’ organigram that shows its major entities/brands as at March 2017 (except for Delivery Hero, which was listed after March 2017). To view the full diagram, click here and go to page 55. Although the points above are valid, we believe they do not represent permanent, structural issues. Naspers’ management recently made it clear to us that they are very aware of the market’s concerns. They are considering how to address these appropriately in time, with some plans already in place. For example, the company will be increasing the allocation of management incentives towards the core assets. Management also emphasised that while there are no restrictions on selling Tencent, the Tencent holding has been providing the cash flow to fund opportunities within the core assets. They also believe that the development spend will generate significant long-term returns for shareholders. Once these short-term issues are addressed, the value to be unlocked is likely to lead to exceptional returns. 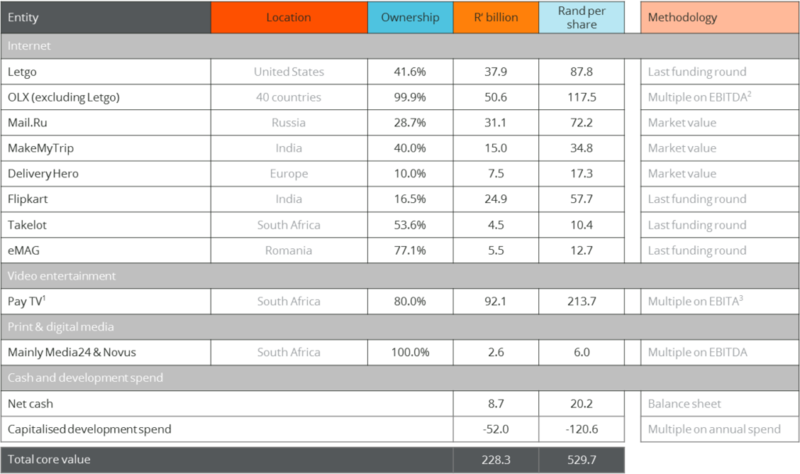 We conservatively value Naspers’ core assets at approximately R228 billion, as shown in Figure 3. Our valuation assessment is based on sum of the parts analysis. 1. Only the South African-based video entertainment is included. In Figure 3, we only valued the internet assets that are currently profitable based on the latest reported revenue and profits (for the year ending March 2017). At this stage, these classified internet assets are generating revenue per internet user of approximately $0.70. This is low compared to their more mature peers like Autotrader and Carsales, which generate $16.40 and $33.10 respectively. Naspers’ management believes that once the classified assets are more mature, they should generate revenue per internet user of at least $10 (more than 14 times the current level). OLX’s current profitable assets are generating EBITDA margins of 45% (earnings before interest, taxes, depreciation and amortisation). Because EBITDA margins are usually higher at maturity, and considering that OLX’s profitable assets are currently growing revenue and EBITDA at a rate of 60% and 70% respectively, we see immense potential for future profits. Figure 4 shows our conservative assessment of OLX’s revenue and EBITDA potential over the next five years, compared to what it has been in the past. We expect OLX to report a profit for the 2018 financial year and estimate that it has the potential to generate $615 million of EBITDA within five years. Applying a 10 times enterprise value to EBITDA multiple to these assets, we could justify a value of $6.15 billion (approximately R80 billion) in five years’ time. We’ve conservatively valued these assets at R49.8 billion (as shown in Figure 3), so the value is likely to be much higher than our estimate. As stated at the beginning of this article, in the past, Naspers traded at a premium to its investment in Tencent, implying that it was expensive relative to its underlying value. It is now trading at a substantial discount to its investment in Tencent, while implying no value in the core assets. 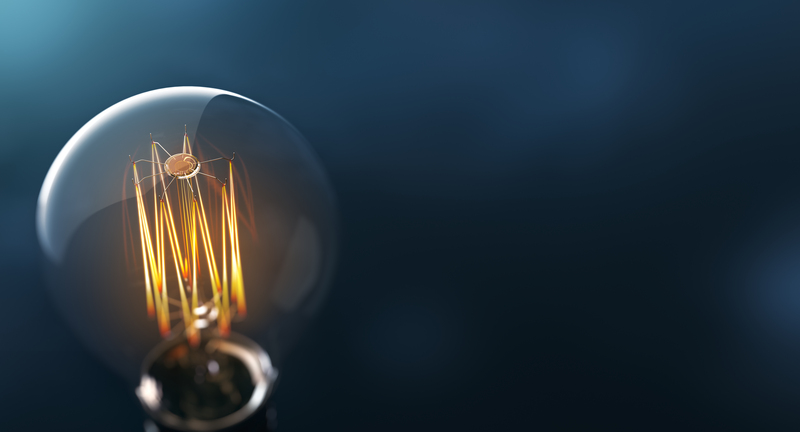 Our assessment shows that we see considerable value in the core assets, which makes for an attractive investment opportunity in both the core assets and Naspers. For this reason, in addition to our investment in Naspers’ core assets, we have also made a direct investment in Naspers. Our investment philosophy is based on the belief that asset prices are often not a true reflection of the assets’ long-term value. In the case of undervalued assets, where the price is lower than the true value, we can exploit that mispricing to achieve superior long-term returns for our clients. The mispricing of Naspers’ core assets is an excellent example of such an opportunity. Our investment in the Naspers core (Naspers, excluding Tencent) is through the Deutsche stub (listed on the JSE). Claude co-manages the SIM Value Fund. He started his career in 1993 at Karlein Investments. In 1994, he joined Sanlam Asset Management as an equity analyst and in 1998 moved on to Gryphon Asset Management as an analyst and portfolio manager. He returned to Sanlam Investments in 2002 as head of equities. He managed the SIM Industrial Fund, receiving both a Standard & Poor’s and Raging Bull award. He also managed the SIM General Equity Fund for five years, achieving consistent top-quartile performance for each of the five years.